White wild indigo is a long-lived perennial herbaceous wildflower. Its showy white blooms are borne on erect, terminalracemes that extend a foot or more above the foliage and remain for several weeks. A single plant may produce several flower stalks. Leaves are compound, alternately arranged, and comprised of three bluish-green, elliptic to ovate leaflets. 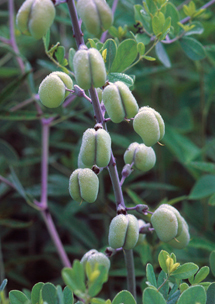 Youngseed pods are green and turn grayish-black as they mature. They often appear inflated. Many species of Baptisia were historically used to produce a blue dye, hence the common name of the genus, indigo. To see where natural populations of white wild indigo have been vouchered, visit florida.plantatlas.usf.edu. Garden tips: White wild indigo works well in a mixed wildflower planting, particularly in the background given its relative height. It dies back in winter, but returns in the spring. It does not tolerate root disturbance, so plant seed or seedling where the mature plant is intended to remain. White wild indigo plants are often available from nurseries that specialize in Florida native plants. Visit www.plantrealflorida.orgto find a nursery in your area. Seeds can be purchased through the Florida Wildflower Growers Cooperative.